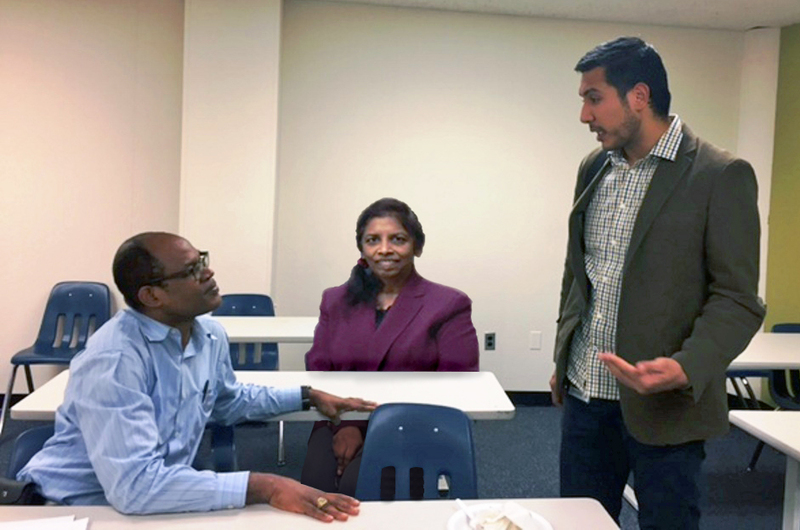 From left, Christian Nwamba and Desiree Meyers, faculty mentors at the Wayne County Community College District, talk with Victor Cazares, a U-M postdoctoral fellow. They’re at two different ends of the higher-education journey: some just starting out on associate’s degrees, others finishing up advanced training after earning a doctorate in biomedical science. But there’s a lot they can teach one another, with the help of their professors. Through a new five-year National Institutes of Health grant totaling $3.64 million, the two types of “learners” will come together for science and engineering education at two southeast Michigan colleges. Henry Ford College and the Wayne County Community College District have signed on to allow U-M Medical School and College of Engineering postdoctoral fellows to co-teach in their classrooms, working alongside their faculty. The postdocs, who specialize in the fields of physiology and biomedical engineering, will hone their teaching skills with the help of HFC and WCCCD faculty mentors over four years. By planning and teaching a course together, the postdocs can prepare to teach and mentor students when they obtain their first faculty jobs. Meanwhile, the associate’s degree students will receive team-based teaching from the U-M postdocs and the partner college’s faculty member in their engineering and science classes. The students will also have a chance to learn about scientific careers directly from a working research scientist and to apply for summer experiences working in the same U-M research laboratory as the postdoc. 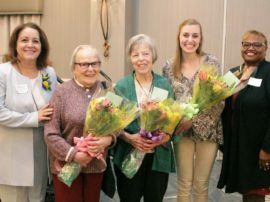 The program, called the Institutional Research and Academic Career Development Award, builds on initial seed funding provided by the Office of the Provost and the deans of CoE and the Medical School, coupled with a pilot program at HFC and WCCCD. With the new grant, U-M will be able to select three postdocs each year for a four-year stint that will involve teaching, research and mentoring by participating faculty. The new grant makes U-M the 22nd site in a nationwide network of IRACDA centers funded by the National Institute of General Medical Sciences over the past 15 years. The program aims in part to address a longstanding lack of diversity in scientific careers. Both of the colleges in the partnership have a high percentage of students who are from backgrounds that are underrepresented in science. Some of the U-M postdoctoral fellows chosen for the program will also be from such backgrounds, but all those chosen will be committed to careers working with such students. Neuroscientist Victor Cazares and computational physiologist Wylie Stroberg have already been chosen as the first two U-M IRACDA fellows. 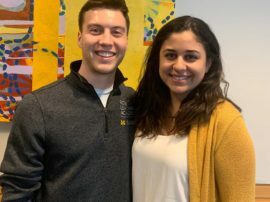 Candidate trainees at U-M and other institutions nationally will be able to apply for enrollment on an annual basis in what is expected to be highly competitive positions. David Sept, professor of biomedical engineering, who co-leads the program, noted that NIH statistics show IRACDA fellows were more productive scientifically than traditional postdocs. In the pilot phase of the U-M program, both the mentors at HFC and WCCCD and the participating postdocs expressed how pleased they were with the opportunity. The new program adds to U-M’s existing efforts to help postdoctoral fellows prepare for careers in academia, industry, government and more. The Center for Research on Learning and Teaching, which offers many teaching and learning workshops and seminars, is a co-supporter of the IRACDA effort.